BANGI, 30 Dec 2013 – Director of UKM Solar Energy Research Institute (SERI), Prof Dato’ Dr Kamaruzzaman Sopian is the only scientist from The National University of Malaysia (UKM) to be made a fellow of the Academy of Sciences Malaysia this year. 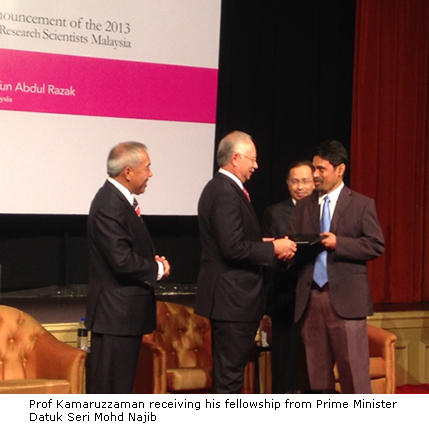 He is among the 19 Malaysian scientists conferred the fellowship at a ceremony in Kuala Lumpur earlier this month by Prime Minister, Dato’ Sri Mohd Najib Tun Razak. The new fellows were elected at the ASM annual general meeting in April comprising three from the Medical and Health Sciences discipline, another three each from Mathematical and Physical Sciences and five each from Engineering and Computer Sciences, Biological Agriculture and Environmental Sciences. UKM News Portal was told that criteria for the appointments are very stringent. The Fellows have the right to use the FASc designation. ASM is a think-tank for science and technology and on how science can benefit the country as well as sustain the nation’s development. It was established under the Academy of Sciences Act 1994 and was officially inaugurated by then Prime Minister Tun Dr Mahathir Mohammad on Sept 8 1995. ASM currently have 241 fellows who are the country’s top thinkers and strategists in science, technology and innovation (STI) drawn from the academia while some others are industry leaders. Prof Kamaruzzaman is an expert in renewable energy technology and have been involved in the field for more than 25-years. His main contributions are in solar radiation modeling and resource assessment, advanced solar photovoltaic systems (grid-connected photovoltaic, solar powered regenerative fuel cell, solar hydrogen production, thin film silicon solar cell) and advanced solar thermal systems (solar cooling, solar heat pump, solar assisted drying, combined photovoltaic thermal or hybrid collector). As a leading scientist in his field, he has delivered many keynotes and plenary addresses at national and international conferences on renewable energy. He has undertaken assignments in about 10 countries for international agencies and programmes such as UNDP-GEF, UNIDO, ASEAN EU-Energy Facility, ASEAN-Australia Economic Co-operation Program, ASEAN-CIDA (Canada International Development Agency), JSPS-VCC, British Council CHICHE, ISESCO and UNESCO related to renewable energy technology. Prof kamaruzzaman has been appointed as the Honorary Professor of Renewable Energy, at the Faculty of Built Environment, University of Nottingham, United Kingdom (2009 -2013). He has been appointed as associate editor for the Journal of Renewable Energy and the Journal of Sustainable Cities and Society published by Elsevier Ltd. He has also won several international awards for his academic contributions in renewable energy including the IDB (Islamic Development Bank) S&T Prize 2013, World Renewable Energy Network Pioneer Award 2012, ASEAN Energy Awards (2005, 2007 and 2013). He has 2 patents, 20 patents pending, 6 copyrights and 1 trademark for his innovations in renewable energy technology. For all that he has won over 90 medals in national and international innovation and invention competitions including special innovation awards such Prix de L ‘Environnement by the Swiss Society for Environmental Protection, 2001, Geneva; Special Prize, Korea Invention Promotion Association, INPEX Pittsburgh 2008 and Sustainable Environment Award, INNOVA 2008, Brussels, KETHHA Industrial Award 2013 and Energy and Environmental Award, INNOVA 2013. Promoting renewable energy technology to the communities has always been his passion and for that he was awarded the Gold in the Malaysia GreenTech Awards 2012.